Andrew Mackenzie, David Rigby, Matt Philips ,& Phil Lucas. Since the band's heyday when the eight piece Orchestra released EP's, LP's, cassettes and CD's as well as appearing on numerous television shows including a 30 minute feature as part of Granada TV's Music on the Move series and playing for HRH the Prince of Wales when he visited Liverpool, the Blue Mags have gone through several changes, mainly brought about by the death of members. By necessity, it went from a popular entertainment focussed 1920's style band, to a slightly more swing orientated band. Now ,with the injection of younger musicians (an extremely talented 18 year old drummer), a 1930/40s swinging Chicago style Dixieland jazz is wowing the fans at the new Tuesday night venue. 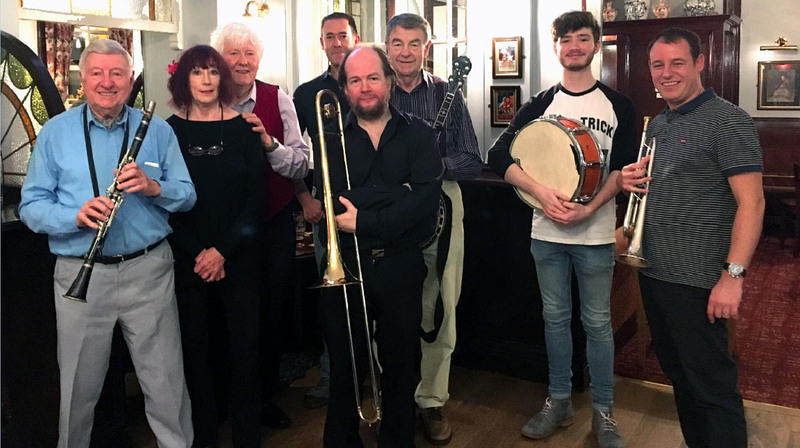 The band has just moved from its long standing venue at Rose Lane British Legion in Mossley Hill, Liverpool as from the 29th of August 2017, to The Rose of Mossley, which is the pub right next door and where the band have started regular weekly sessions.